The DR-X10C scanner is capable of maintaining impressive scanning speeds of up to 130 pages per minute and 260 images per minute,* in color, grayscale, or black-and-white, due in part to a dedicated, onboard Image Processing Chip. This hardware chip can handle multiple image processing functions simultaneously, virtually independent of connected PC performance. To support these speeds, fast connectivity is offered with Hi-Speed USB 2.0 and SCSI III ports. The DR-X10C scanner also allows for optional onboard Kofax VirtualReScan (VRS) implementation. This hardware solution will deliver the full advantages of VRS image enhancement capabilities, as well as improved scanning speed and productivity. The DR-X10C scanner introduces the industry's first dustfree scanning system. A revolutionary three-step approach helps prevent dust particles from accumulating and adhering to the sensor glass, resulting in clearer images and minimized manual cleaning. Uniform, consistent images are captured with utmost precision and clarity—at up to 600 dpi—due to Canon's advanced image processing features, which include Automatic Shading Mechanism and Three-Dimensional Color Correction. The DR-X10C scanner delivers smooth, jam-free feeding of a wide variety of document sizes, from business cards up to 11" x 17", or even 22" x 34" in Folio Mode. ** And batch scanning preparation time is reduced with the industry's first dedicated page size and skew detection sensor, a new fivelevel user-adjustable Active Separation Torque controller, and Staple Detection feature. 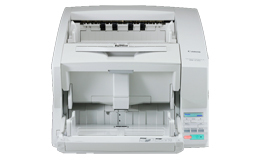 For further flexibility, the DR-X10C scanner is equipped with three user-adjustable Ultrasonic Double-Feed Detection sensors to correctly batch-scan documents with attached photographs or notes. 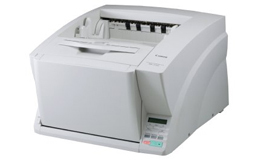 Plus, a Double-Feed Retry mechanism—which reverses documents and attempts to feed them again—and Canon's Rapid Recovery System ensure the DR-X10C scanner's superior, reliable, and flexible document handling. Physical dimensions 14.8 x 20.8 x 22.2 "
ADF Feeder Paper Size Min. - W x L 2.0" x 2.8 "
and 256 images per minute, in color, grayscale, or black-and-white. connected PC performance for quick scan jobs. flexible document handling for more unattended batch scanning. demands of production level scanning. buttons for customizable one-touch job access.